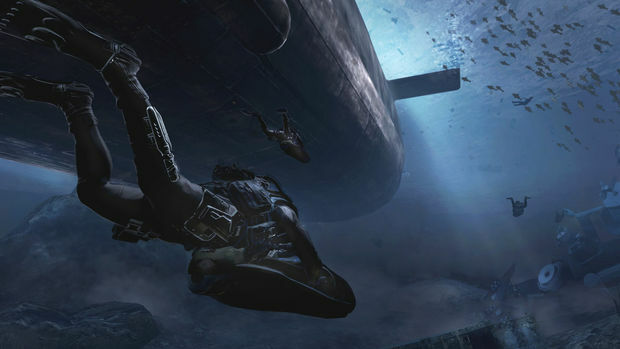 Without a doubt, Call of Duty: Modern Warfare 3 is set to be one of the biggest games of the year. The Call of Duty franchise is a pop-culture phenomenon, and Modern Warfare 2 is still in the top 10 most played games on Xbox Live. Before we're given the world-premiere preview of Modern Warfare 3, Infinity Ward's Creative Strategist, Robert Bowling, explains to the audience what some of their goals were going into the sequel. 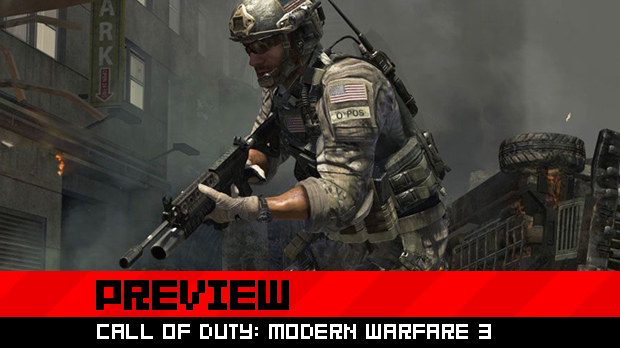 "We came out of Modern Warfare 2 with a very strong vision of what we wanted for Modern Warfare 3. 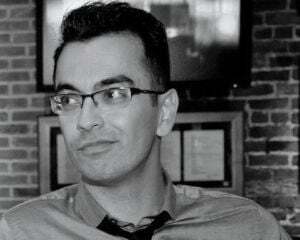 Things we wanted to add, things we wanted to polish [and] deliver to our fans." 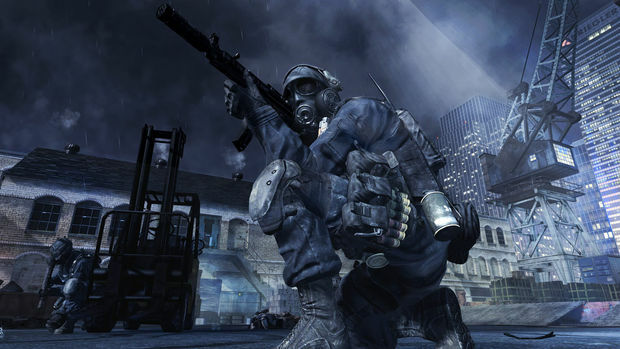 Glen Schofield, general manager and co-founder of Sledgehammer Games, continues by explaining that Modern Warfare 3 "picks up right after Modern Warfare 2. D.C. is burning, Task Force 141 is either dead or on the run and battles wage all along the Eastern seaboard." The demo then starts with the player in the shoes of Frost, a member of Delta Team. He and his main squadmate, Sandman, are in a helicopter in downtown Manhattan just as it's knocked out of the sky by an RPG. The two survive the crash; opening the door to the downed chopper sees you looking right up at the many skyscrapers of New York City. "We're taking the scale up to an entirely new level," explained Bowling. "We're taking players from the outskirts into the heart of major cities around the world. We're delivering urban combat in places like Manhattan, London ... all over Europe, parts of Africa, Russia, Himalayas. It's a conflict that really covers the entire world." Once out of the chopper, the action kicks in and it's largely the same type of combat you've come to expect from the Call of Duty franchise. This mission sees the US military repelling Russian soldiers occupying New York and the player has to push his way through various buildings and iconic areas like Wall Street. You'll even have a firefight in the New York Stock Exchange. The main weapon being used in the demo was what I believe to be a new rifle (sorry, names weren't given) with a new attachment that will in all likelihood become a staple in multiplayer. The attachment is a hybrid of the Red Dot Sight and ACOG Scope, offering the player the ability to seamlessly switch between medium- and long-range firing. The ACOG Scope sits off to the side and behind the Red Dot Sight; when needed, players will grab the scope and quickly reposition it to the top of the gun. Another new gun shown off was a cross between a grenade and rocket launcher. The gun looked like an oversized radar detector; players can fire grenades while aiming at targets through the scope like a rocket launcher. The final new weapon shown off was a 9-Bang flashbang grenade. It's like a regular flashbang, but goes off several times for maximum confusion. In this mission, Delta Team learns that the Russians have put a communication jammer on top of a building, so your team makes its way to the jammer's location to destroy it. Once it's taken care of, Russian soldiers on various rooftops, along with an attack chopper, rain bullets onto your position. The player is given a laptop and uses a Predator Drone to launch some missiles against the attacking forces. Once most of the area is cleared, a US helicopter comes to pick up Delta Team and puts the player behind the on-board mini-gun. A couple more enemy choppers appear; you go back and forth with them until the last helicopter you take out crashes into yours. The situation appears bad, but evidently your chopper didn't get too banged up, and eventually stabilizes. The next part of the demo sees you in the role of Burns, a soldier in the London forces. He and his small team are on a covert mission and need to secure the contents of a truck. The first part of the mission has you covertly silencing enemy forces until reaching the target zone. The team then goes loud and takes out everyone in the area while securing the truck, which was apparently a decoy -- the truck is empty. The team, now joined by an attack chopper, presses forward and pursues its target to a subway train, which takes off just before the team can reach it. The forces then split off into two groups and give chase by commandeering a couple of trucks. The chase was a constant back-and-forth battle, as your team had to avoid oncoming subway trains and take out the enemy soldiers firing on you from the target train. Eventually, your allies' truck crashes into the train you're chasing, causing it to derail. You can see parts of this subway crash in the recently revealed gameplay trailer. That's it for your first taste of Modern Warfare 3. You can expect more to be revealed over the next few months for single-player, multiplayer and Spec Ops mode. Spec Ops is "coming back in a huge way," according to Schofield, and will feature some new game modes. Visually, the game looks largely the same, although there was definitely a lot more going on and there seemed to be a little more visual polish too. Of course, everything will be presented at 60 frames per second. It's definitely going to be a big battle this year when it comes to first-person shooters. Either way you cut it, though, it will be a good year for fans of the genre all around.